People who work in a building certified green by the US Green Building Council enjoy several advantages over those who work in high performance buildings that are not green certified. Researchers at Harvard’s School of Public Health and State University of New York’s Upstate Medical University studied 109 workers at 10 buildings in 5 cities across the U.S. 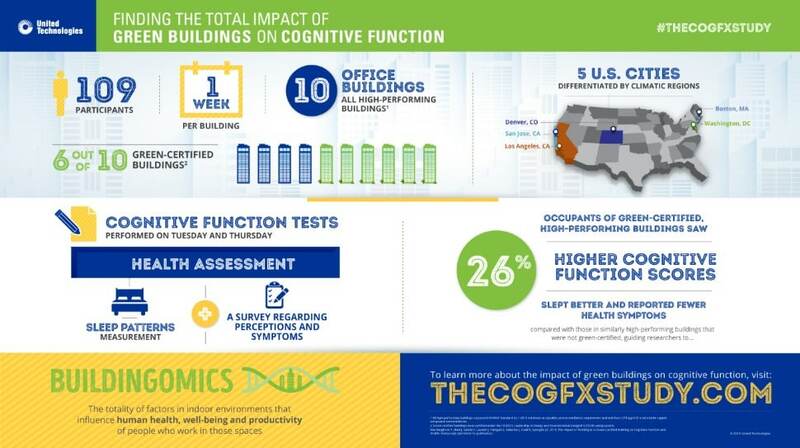 They discovered that working in a green certified buildings correlates with higher cognitive function scores, fewer sick building symptoms, and higher sleep quality scores. In 2015, the researchers conducted what they called their COGfx study. That’s shorthand for the brain’s cognitive function. That study found that workers in a simulated green building environment with enhanced ventilation had significantly higher cognitive function compared to a conventional building environment. This latest study builds on the COGfx study and was presented for the first time at the U.S. Green Building Council’s annual Greenbuild conference in Los Angeles. It found that employees in high performing, green certified buildings have 26% higher cognitive function test scores than those in similar high performing buildings that are not green certified, even after controlling for other potential explanatory factors. In addition, the study turned up several other important findings about employees working in green certified buildings. The study also found that employees reported 30% fewer sick building symptoms and had 6% higher sleep quality scores compared to those working in high performing buildings that were not green certified. That last finding indicates that benefits of green buildings may extend beyond the end of the work day. Based on their latest findings, the research team believes a holistic approach is needed. “We’re advocating for what we call Buildingomics – a new approach that examines the totality of factors in the building-related environment,” said Dr. Joseph Allen, assistant professor of exposure assessment science at Harvard. Allen was the principal investigator for the study. “Through [the] Buildingomics multi-disciplinary approach, we aim to better understand the factors that influence health in buildings and unlock the ability to optimize buildings for improved cognitive function and health,” said Dr. Allen. The full report – “The Impact of Working in a Green Certified Building on Cognitive Function and Health” – will be available soon online. Primary support for the study was provided by United Technologies, which makes many of the heating, air conditioning, and ventilation systems and control networks used in green certified buildings.